Protect your dog’s paws from the uncomfortable and irritating side effects of snow, ice, and rock salt at this time of the year with 100% all natural Musher’s Secret! 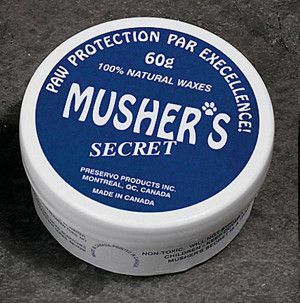 Musher’s Secret was originally developed for sledding dogs, who needed protection against the extreme conditions and temperatures they were facing in upper Canada. Once the founders saw how effective it was at protecting dogs paws they started to market their product to specialty retailers. Musher’s Secret is an all organic paw wax that can be applied to the paws of dogs, horses and many other animals to provide a barrier against all sorts of harsh conditions. The paw wax dries in seconds to provide a semi-permeable layer between your animal’s paws and salt, snow, ice, hot pavement, sand, etc. It can also be used to help animals heal from wounds to their feet. Here’s the easiest way to apply: Put each paw directly onto the wax and rub the paw around. Use your fingers to work the wax into the spaces between the pads. Wax-covered paws will not stain floors, rugs or furniture. Easy to apply: Put each paw directly into the wax and rub the paw around. Use your fingers to work the wax into the nooks and crannies around the pads. The wax dries very quickly and provides an immediate barrier against snow, ice, hot surfaces, rock salt, and more. Generally recommended to be applied once a week, but if your dog does a lot of walking/running then it may wear off in as little as 2-3 days. Apply as necessary. Advantages: The great thing about Musher’s Secret is it is made from only food-grade, organic wax, so you don’t have to worry about your pet getting sick from licking the wax off it’s paws. It also won’t stain your furniture, and it’s non-allergenic.